Description of "Be a B.A." "Simplistic, exemplary, structured and thoughtful content of the book makes it one of the best for the Business Analyst fraternity!" - Yogesh More, Executive Manager, ADP. If you are looking forward to start/advance your career as a Business Analyst with Leading companies like Deloitte, KPMG, Accenture, TCS, Google, Microsoft, Cognizant, EY, Cisco and many more ; grab the Be a B.A. book and start your journey! Business Analysis (BA) as a profession has proven its own success by bringing significant value to any of the business an Organization/Institution operates, BA practice is much appreciated across industries. However there are still challenges, so many why, what and how questions for the profession itself. Hence an attempt is made to address various aspects of the profession in this book, Authors have taken a step forward to reach the professionals along with aspiring Business Analysts via this platform. With consulting companies open to hire non-MBAs, this book will be an excellent book to begin for aspiring Business Analysts (B.A.’s) as well. The book discusses aspects such as Overview of Business Analysis, Need of B.A.’s, Hiring Process and Exercises (that would help for any interviewees and for career transition aspirants), Why B.A., Roles & Responsibilities, Skills Set, Evolution of the Profession, Ambiguity in B.A. Designations, Success Stories of B.A.s, Interesting Facts and many more. “This book truly stands out in terms of its structured execution of ideas. So, much so that one can easily make out it would have come from a business analyst or a consultant. It clearly simplifies what it needs to take to be a B.A. and the path to achieve the same. It is very well suited to the likes of the emerging business analysts. 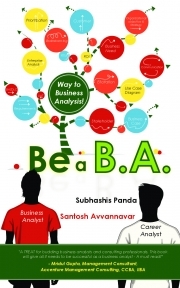 It blends both the theoretical and practical aspects of the business analysis profession. The cases explained at various places testify the role of the business analyst further and add reality to the very existence of this role in real world. Subhashis Panda, CCBA® : Subhashis is a CCBA certified practitioner of Business Analysis in MNCs (Global HCM Solutions Leader, Fortune 500 Organizations). He has extensive exposure to IT Business Analysis engagements and he has been involved with multiple client assignments for business solutions. He is part of product management activities as well. He is a B.E. graduate from VTU, Belgaum, Karnataka. Also He is a Gold Medalist for holding excellence in academics and bagging University Rank. Recently he completed the course ‘Innovating in Healthcare’ from Harvard Business School and obtained Honor Code Certificate. He keeps investing himself in the business analysis world to explore every developing phase of the profession and opportunities. Knowledge sharing at global level is something passionate him in his day to day life. He is also keen in training and mentoring Business Analysts for a successful career journey! He also dabbles in fiction writing and is the author of Adhuri Prem Kahaniya; Dear Wife, Your Husband is not a Superhero, Second Heart, Get a Job WITHOUT an Interview – Goolge & Beyond, and Surrogate Author. He likes to devote his personal time in writing for a website, namely the Amrita Foundation for HRD (www.amritafoundation.wordpress.com). He has conducted seminars and training sessions for more than 35,000 people in India and abroad over the last seven years. Reviews of "Be a B.A." This book provides Amazing Insights into Business Analysis that are evolving in Market. Interesting Illustration and examples so relatable makes it an interesting read. Extremely well-articulated and easy to understand concepts make you learn . Highly Recommended to All directly and indirectly connected with BA. Simple and structured thoughts of the book, makes it unique in the category Business Analysis. I would recommend this as a must read for BA professionals and aspirants! Picked this book with much enthusiasm as the name says 'Be a B.A.' :) I would say this was a perfect read for a B.A. aspirant like me.This is AWESOME...!! !